Back in Major 1 after a year's absence, the firsts made a strong start to the campaign. In the space of just five days, they earned a hard-fought point at perennial rivals Castle Park, before Collie Barrett's hat-trick inspired a 7-2 over former FAI Cup winners Transport at Rockfield Park. 48 hours later, they faced Stillorgan Lakelands at Marlay Park, and seemed to be heading towards a shock defeat after Stephen Robinson's bizarre own goal early in the second half. But Mike O'Neill came off the bench to fire home an equaliser from long range, before Barrett's brilliant winner in the 90th minute. The team's momentum was halted by four defeats in five matches, the only respite being a thrashing of Stillorgan in the return fixture, and that run also saw their Polikoff Cup hopes ended by Hyde Park, despite Paul Lydon netting a hat-trick in Balbriggan. But the side bounced back with four straight wins to put themselves back in league contention, as they secured payback for earlier defeats against Eblana and Boyne Rovers, before yet another big win over Transport, when Mark Sullivan grabbed three. Seaford were unable to capitalise, hwoever, as they followed up a defeat in Portlaoise by conceding last-gasp equalisers in the last two matches before Christmas against Park Celtic and Ballyoulster. Jamie Brennan rolled back the years by notching as Seaford elinated Park from the Cullen Cup, and Major side DCU were also knocked out before Seaford came acropper against Tullamore Town, losing 2-1 despite a brave showing. League form was a mixed bag, with Seaford never threatening the promotion spots. They nonetheless had their say on the title race, earning a brilliant 2-1 win over Portlaoise courtesy of an extraordinary goalkeeping performance from Ian MacHugh, and a superb injury time winner from Steve Hyland. Ultimately, however, the season fizzled out somewhat, and a disappointing last-day loss against Park saw Seaford drop to sixth in the final standings. The most frequently selected team, based on minutes played. The seconds endured a difficult campaign in Sunday Division 2, but the 2013/14 season will ne remembered for their finally bringing some silverware to the club by winning the Arthur Lynch Cup with a famous win over Valeview Shankill in Enniskerry. Maintaining a strong tradition for the seconds, Paddy Hughes's team had a poor start to the season, losing five of the opening seven games, before embarking on an extraordinary series of massive wins, punctuated only by a disappointing loss to Pegasus. First Dan Kiely bagged four goals away at Beechhill United, with Peter Glynn adding a fifth with a stunning overhead kick. Then, in the space of a week, Seaford scored 11 and 12 in consecutive matches against AZ Alpine and St Pat's SC, earning national press coverage for their achievement. Collie Dolan ran Alpine ragged with four goals and four assist, whilst Kiely bagged five on his own against Pat's. Seaford then routed Cherryfield United 6-2 to keep the prolific spell going. But the side's league form went off a cliff, as they picked up just one point in their next seven matches. By that time, however, the cup campaign had taken precedence. Matt Tappin's brace helped them to a second round win over Terenure College, before Glynn led a comfortable quarter final win over Beechhill, which was notable also for Barry Kirwan's remarkable headed goal from inside his own half. The semi final against Woods United was a day of high drama, as keeper Edd Ryan was dismissed for violent conduct early in the second half. Tappin donned the gloves for the remainder, and Seaford sealed a place in the final when substitute Mike O'Neill fired home from long range, prompting unbelievable scenes. If they had rode their luck during the semi, they left nothing to chance in the final, in front of a crowd of 150 at Berryfield Park. Kiely fired Seaford ahead in the first half, but it was after the break when Seaford really took charge of the game. They were unable to make their advantage count, however, with Kiely missing a golden chance for a second by passing the ball wide of the empty net from 30 yards, having rounded the keeper, and it seemed as if the top goalscorer's lapse would prove costly when Valeview equalised with 20 minutes to play. Seaford stormed back, however, with Collie Barrett bravely heading home to restore their advantage, and almost directly from the restart the same man burst past a slew of green defenders before rifling home Seaford's third. 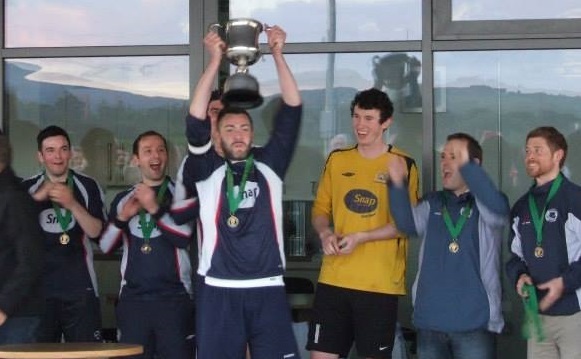 There was still time for man of the match Pater Glynn to thump home a fourth, so that the scoreline fairly reflected the degree of the whites' dominance, and captain Barry Kirwan was finally able to lift the first trophy in the club's history.